Awareness is the first step to change. A good few years ago now, I remember being in this constant state of parenting overwhelm, struggling to make it through the day without my daughter having a mega tantrum, losing my cool or having endless power struggles. I love my kids but I wasn’t enjoying the journey. I felt stuck. 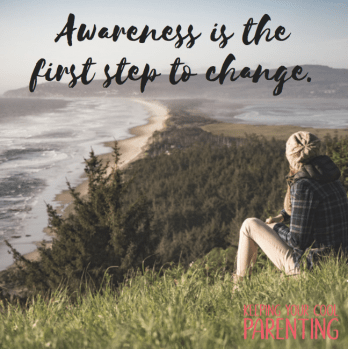 Things only began to change when I woke up off parenting autopilot and become aware of the tools in my parenting toolkit. It is ONLY through awareness that we start to make the necessary changes. We can’t change what we don’t know! It’s almost like we have been blinkered before, it doesn’t register, we don’t question ourselves. BTW This is not a judgemental exercise, it is just a wake up off autopilot exercise. As I said before, we can’t change what we don’t know! Most of us use the same tools handed down from our parents, it’s what we know, it’s our parenting blueprint. So, before I go into detail I want you to start becoming aware of the language we typically use when asking our kids to do something. You see, most of us have learnt the ONLY way we can get our kids to do what we ask is by using fear and shame. And we don’t even realise we are doing it. We use control OVER our child for short-term compliance. And THIS path is full of up-hill battles and power struggles. SO WHAT DOES FEAR AND SHAME SOUND LIKE? When we shout, scold, tell off, threaten to take something away, counting to 3, cancel a party or playdate. All of this is using FEAR to get compliance. When we say things like: “What were you thinking? !” “I can’t believe you just did that?“ “You should know better.” ”Stop being such a baby!” “Even your brother can do it, why can’t you?” “ Oh there you go again, there’s no pleasing you!” This is using SHAME to gain compliance. Using shame and fear to control our children is so ingrained into our parenting tool kit most of us are not even aware we are doing it. This is not about judging ourselves or others, this is ALL about waking up off autopilot and questioning the tools we use and whether or not they are working for us. And maybe this is why our kids stop listening to us and we find ourselves in power struggles and stress? Would we speak to our partner, friend or relative in the same way, if we were asking them to do something for us? And if we wouldn’t then why do we speak to our children like that?